Transfer almond butter into a container. Cover and refrigerate. 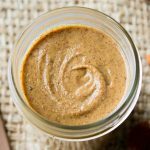 Get this recipe for DIY Almond Butter - One Ingredient Only at https://www.theworktop.com/breakfast-brunch-recipes/diy-almond-butter/.